The PluginKit SDK is provided to help developers design a VR DeviceService. It encapsulates the communication between a VIVE Wave™ Server and a VR DeviceService. It also provides mechanisms for defining data transmission. The PluginKit has defined several interfaces to make it easier to develop drivers. A VR DeviceService can currently send three types of data (pose, button, and analog) to VR apps. When developing a VR DeviceService, you should define what role your device will play and what data type your device will send. You can decide how to use the tracker. For example, you can use the Android™ sensor manager (sensor.TYPE_GAME_ROTATION_VECTOR) as tracking data, and send the data to the VR App so the tracker will move with the smartphone. Or you can use a different path for the tracker. For example, the path could be a circle or a line. VRCameraInterface provides an interface to let developer customized their own camera device. Currently, we only support customized camera features on HMD. The VR DeviceService is responsible for transmitting data from the VR device to the VR application. All VR DeviceServices are managed by a VIVE Wave™ Server. 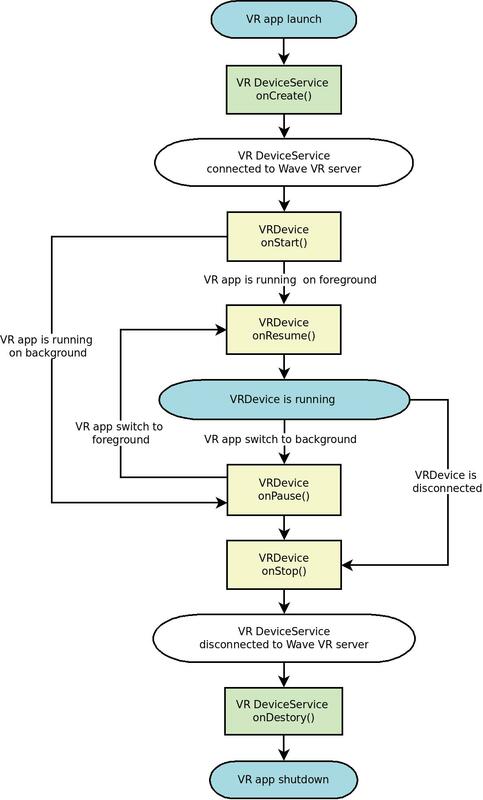 A VR DeviceService will transmit data to the Wave VR Server continuously. To optimize your VR application, you should save power or release unused resources when your VRDevice enter onPause().